I am constantly blown away by the things that people make with their hands, and Lynn Mohney’s creations are no exception. 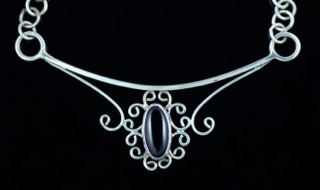 Lynn is an incredibly talented jewelry metalsmith with an appreciation for history and stories. Her work, which combines intricate metal work and beautiful set stones, is inspired by the medieval period. And if you too love a good story, you are going to love how she came up with the name of her business, Prunella’s Workshop. It was a combination of things. I have always been very creative, and I have a degree in graphic design. I actually saw myself writing and illustrating children’s books originally, and I have not written off that idea. I had this really pretty handmade sterling silver tiger eye necklace that I had bought myself, but I had no idea how someone would go about making something like this. I certainly was not aware it was something I could do myself with the right equipment and knowledge. I dabbled a little with beading, but I found it completely unsatisfying; however there was still this very strong urge to create jewelry. In addition my husband had bought me some rather nice jewelry I did not like particularly. To my pleasant surprise, he signed me up for a beginning class in metal jewelry at Metalwerx, in Waltham, MA for my birthday. He decided he should give me the gift of being able to make my own jewelry. A love affair with metal was born. I cannot for the life of me figure out where the tiger eye necklace is, but my black onyx filigree necklace is extremely loosely inspired by it. What is the story behind your business’ name? When my grandmother was pregnant with my mother, she called her Cinderella. When my mother was pregnant with me I made her so ill she said I must be one of Cinderella’s stepsisters, and called me Esmerelda Sue after one of them. I found out I was pregnant with my son just as I was beginning my class at Metalwerx. Despite terrible morning, noon, and night sickness, I loved my class; however, I was so miserable I decided I should refer to him as the other stepsister, Prunella. Of course, once he was born he acquired a more masculine name. Later, we decided we wanted to make jewelry a real family business, and we needed a name. Our work is inspired by fairytales and original work from the renaissance and medieval period. We felt that using Prunella’s Workshop reflected our style and integrated our family history. The fact that my son never needs to be embarrassed by actually admitting that he is Prunella is an added bonus later in life, but for the moment he wears the honor with pride. My business is in my home, and I am a stay at home mom. I am forever balancing the needs of creating, promoting, and selling my work, and caring for my two children. As I write this, my 20 month old daughter is trying to determine if it’s appropriate to dance on a glass coffee table top. My business is relatively new and I’m working on getting a following. Eight months ago today I would have been sitting in a cubicle in a dreary office job that I had performed for 15 years. Making the decision to make the leap was perhaps one of the scariest most rewarding thing I have ever done. I love being able to be closer to my family while I get the opportunity to create. I am inspired by stories and history. I love learning how people managed to craft with so many fewer tools than what we have available to us today. I am entranced by the power of the imagination to orally share a story off the cuff, and I try to tell stories with my work. Metal is beautifully fluid. It seems cold and hard, but it is incredibly malleable. There is great power in being able to manipulate such a strong substance. Jewelry is one of the few things that can really stand the test of time. We can witness the jewelry worn in biblical times as we have many references available to us. I am fascinated by the thought that some day someone may be finding jewelry I made in an archaeological dig. People who treasure the skill and quality involved, will buy handmade items. People who understand that they are supporting small businesses, and not big corporate companies will also buy handmade items. I have noticed that there are those who have a very high respect for the quality, time, and skill that goes into what I make, and there are those who do not understand or care to. For them, a manufactured item made in an assembly line is acceptable as it meets their needs. A great deal of the people who do appreciate handmade items typically are familiar with how to make something, even if it is completely different from what I am peddling. Those are the people who walk up to me and ask me how I do it, and often when I explain the process they buy the item. It is great to be able to actually speak to the artist and learn more about what you are getting. My black afghan sweater by far is my favorite. My Nana could knit or crochet anything. Tell her Mickey Mouse is your favorite cartoon character, and you would go home with a sweater that fit with Mickey across your chest. She did not need a pattern-just a picture of the character. When I was a teenager I wanted this flimsy bright multi-colored pull over crocheted sweater from one of those expensive mall boutiques with a designer label. I was not usually into designer labels, but I loved this thing. My mother would not buy it for me, as she said my Nana could knit it for me in less than an afternoon. We carefully described what I wanted to my Nana. She came back with a warm thick cardigan with granny squares that looked like a wearable afghan. It could not have looked less like what I wanted, but I knew she had made it with love, so I thanked her kindly and did not tell her it was all wrong. I eventually found the desired sweater on clearance and I bought it. I think I wore it twice. My Nana’s sweater went to college with me, and sat on my shoulders on cold winter nights when I was studying. It countered as a lightweight jacket in the spring. I still have it today, and when I put it on I think how smart she was to not listen to what I thought I wanted. I am a writer. I am working on a couple of novels. I also enjoy painting and drawing. I love spending time with my family. I am also a voracious reader. Honestly, I could spend my entire life reading. I think people are surprised when they realize I’m not half as serious as they think I am. I usually am the quiet one who soaks it all in. Very little offends me, and what does offend me is not what people expect. My sense of humor can be very dry, but if I pick on you, it’s a very high compliment. I never pick on someone I cannot stand. I hold myself to a higher moral compass than I hold the people around me. In other words, just because I would not do it, does not mean I think you are terrible because you would! I could not agree more with that last piece of advice! Thanks for joining me on my blog, Lynn, and be sure to check out her shop. I could not agree more, ladies!